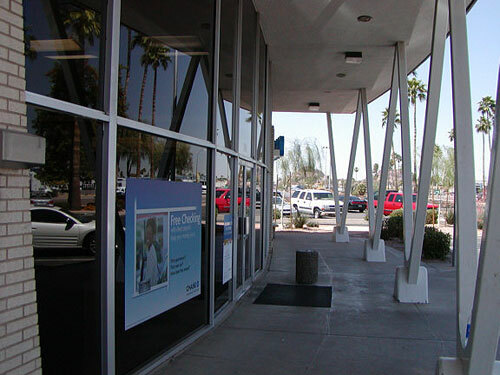 At McDowell and 74th Street in Scottsdale there is a 'space age' branch bank over by the Los Arcos site. 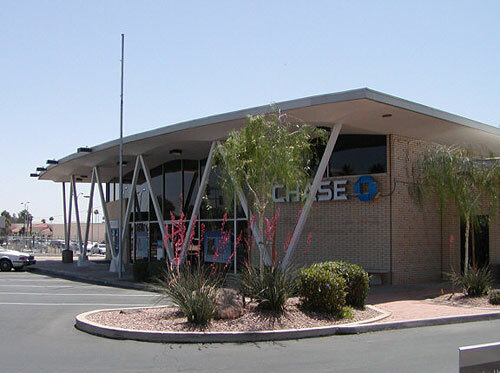 It's a good solid building and strongly modern in vintage and inspiration, a one story high ceilinged 5000-square-foot bank oriented towards the street, built as a Valley National Bank, opened on October 14, 1963, still healthy as a Chase branch. Prospects are good. SkySong is going in next door on the former Los Arcos site; the guy at the front desk asked me, "Are you from the project?" 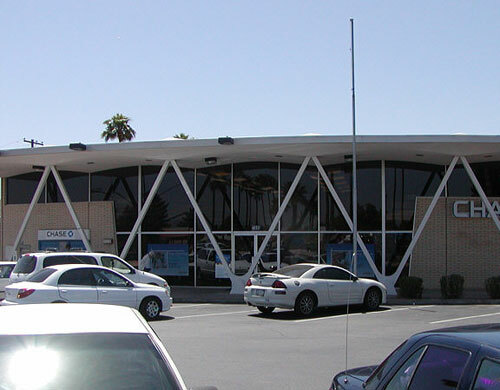 For those of you coming in late, "Los Arcos" was a huge regional mall dating from the mid-1960's, a 3-D manifestation of the lavish swooping space-wasting flamboyant sensibility of the era, the architectural equivalent of a 1967 Bonneville. Its sign featured two elegantly thin caternary arches. My memory is faulty but I remember very wide corridors, very tall entries, and lots of marble paneling. As the years rolled by, as an important retail landmark in South Scottsdale, then as a slowly dying mall with big cavities, then finally in year 2000 as a big conspicuous dead whale, then as the subject of a political stink as the city of Scottsdale tried to attract tenants, then as a big destruction project, then (sigh) (I know) as the site of a threatened convict-tent-city brought to us by America's Toughest Sheriff, Joe Arpaio, even in its absense Los Arcos continues to define this whole neighborhood. Now, starting last week (mid-April 2006), the whole 37-acre site is being re-developed as an ASU satellite campus, SkySong, with buildings by Pei Freed Cobb. 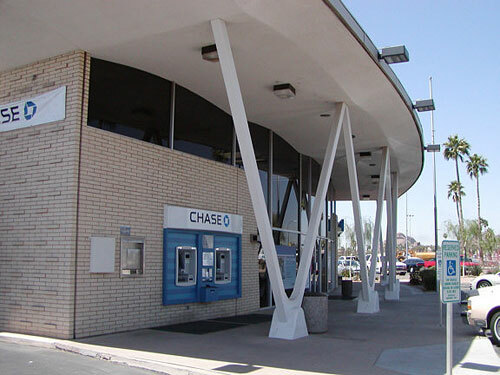 This little bank was built in the huge spaceage Midcentury shadow of Los Arcos and now exists on an outparcel in its huge absense and re-development. 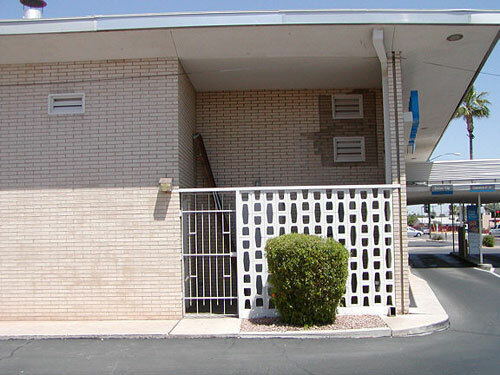 The most striking design element is the system of "V-frame tubular steel columns" supporting the roof in the front, very noticable from the street, looking advanced in an old-fashioned way. Actually it looks like WVW. For my money this counts as both good engineering (because this roof support allows a tall clean glass wall with deep shade, resulting in a very pleasant effect from inside) and good showmanship (because those columns could just as well have been simple vertical supports). Along with those vertical curves, the roofline and glass facade follows a subtle curve. The kind of subtlety that wouldn't survive a cost-benefit analysis these days. 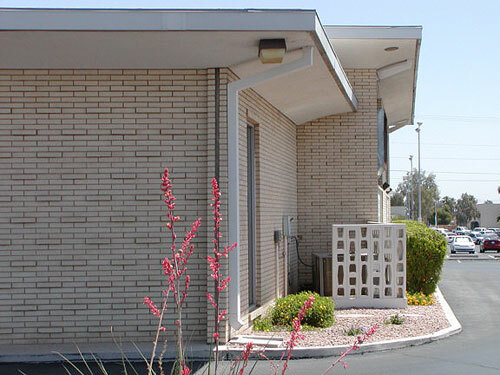 Around the back, windowless expanses of buff brick, some concrete sunscreens, nothing really remarkable. The front originally featured a fountain, now disappeared and paved over, that jetted water in elongated arcs that would have echoed Los Arcos design elements next door, also disappeared and paved over. The current occupants are proud enough of their building to have kept lovely & dramatic vintage photos of the property: photos of architects Cartwell and Rossman with Carl Bimson (Walter Bimson's brother), pictures of tellers playing in the fountain, dramatic high-contrast black-and-white photos of the facade that proves they were, er, banking on their appearance, uh, so to speak. They knew what they had.